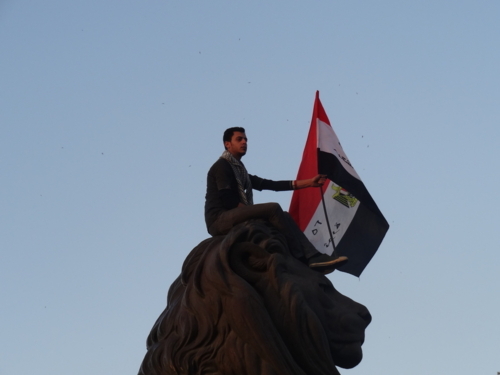 Egypt had a memorial day of revolution on 25th of January. A crowd gathered at Tahrir Square again as if people tried to remember a sense of solidarity and enthusiasm at the time of revolution last year to sweep away the current stagnation. It was a very emotional day for us since the Japan Foundation, Cairo is located in the place just a few minute walk away from Tahrir Square and we had witnessed what had been happening there for a year since the revolution. We saw people gathering, discussing, singing, dancing, praying and siting in, and sometimes came across crush between demonstrators and police or security force at the square. I am reporting you our recent activities. 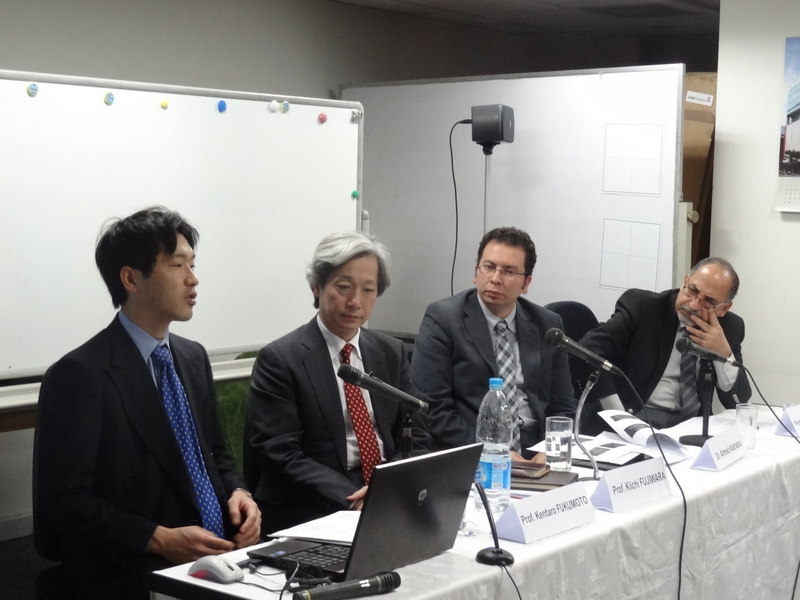 We invited Prof. Kiichi Fujiwara (University of Tokyo Faculty of Law, University of Tokyo Graduate Schools for Law and Politics) and Prof. Kentaro Fukumoto (Faculty of Law, Gakushuin University) to hold lectures at the American University in Cairo and the Japan Foundation, Cairo on 6th of February. Prof. Fujiwara gave us a lecture on the theme ”Democracy the Rule of Law in Asia” and Prof. Fukumoto gave us a lecture on ”The Political Regime of Japan “ and ”Democratic Dilemma in Japan". Egypt started to build a brand new country after the revolution, but faces some difficulties on the process of democratization. People are groping for a way to set up appropriate systems instead of so-called “imposed democracy” and seeking hints and models which help promote democratization. In this environment, the lectures were timely, which examined the process of regime shift by introducing examples of revolutions in the Philippines and Indonesia. We had a very active question and answer session. It was impressive to see many young people asking lots of questions to Prof. Fujiwara and Prof. Fukumoto even after the session closed. You can watch the lectures on USTREAM on the below site. Just like Japanese young people, Egyptian young are less interested in books compared to before. Most of them don’t know any Japanese writer even though they have as much knowledge on Japanese anime and manga as OTAKU! Under this circumstance, “The Short Stories of Akutagawa Ryunosune”, which was published with Support Program for Translation and Publication on Japan by the Japan Foundation, was released on 4th of February. Celebrating its publication, we have prepared many literature-related events for February. 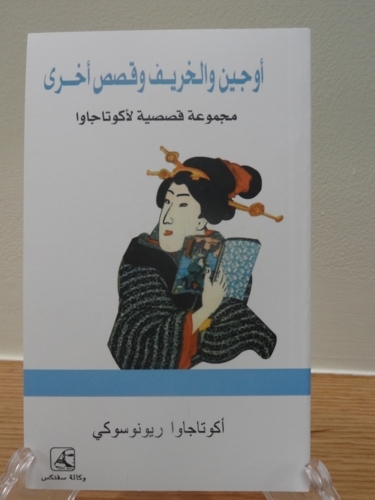 The front cover of “The Short Stories of Akutagawa Ryunosune” in Arabic version! Dr. Wael Orabi (lecturer of Cairo University) presented a lecture on the theme “Akutagawa Ryunosuke and His Age” on 9th of February. At the ceremony to celebrate the publication of this book on 12nd of February, MS. Aya Wael (Arabic translator) talked about the appealing point of the book, and a publisher also explained the significance and background why they published this book. Dr.Ahmed Fathi (Assistant professor of Cairo University) presented a very interesting lecture on “History of Japanese Literature and its Development) on 16th of February (and 1st of March). All the lectures were so interesting that it gave the audience clear image of Japanese literature, which helped them get interested in Japanese literature. We are going to present the theater performance based on short stories of Akutagawa on 27th of February. 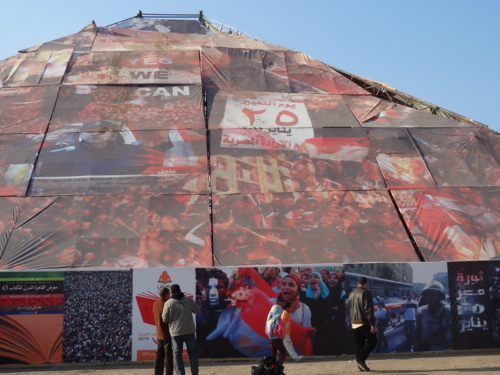 The 43rd Cairo International Book Fair had been held from 22nd of January to 7th of February. I mentioned that young Egyptian are less interested in books, on the other hand, there are many “book warm” to visit book fairs frequently in Egypt. Not only Egyptian publishing companies and bookshops but also many foreign companies participated in the large-scale book fair. Its venue is too large to visit all the booths even though you go there every day. The book fair was just like a festival, so people with their families was able to enjoy attending events, eating foods and hanging around as many cafes and snack stands opened during the book fair. I will show you a picture of a street in Cairo. We had “Mawlid Al Nabi”, which is a day to celebrate the birthday of the Prophet Muhammad, on 4th of February (the twelfth of the third month in the Islamic calendar). People visit Masjid on the day. They also buy some sweets, and go and see their relatives and friends. 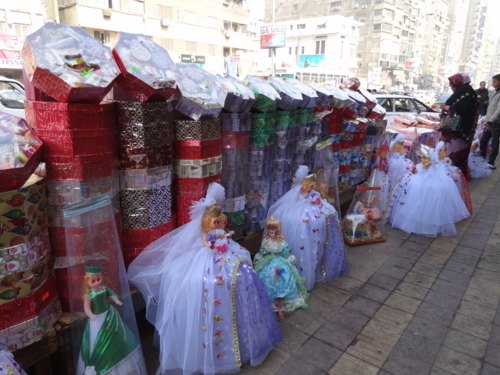 People used to present dolls made from sugar, but nowadays Egyptian become more health conscious, so they try not to eat sugar too much because many Egyptians suffer from disease caused by obesity these days.